While on a recent family car trip, I was searching the glove box for an ice-scraper and found a collection of old state maps. 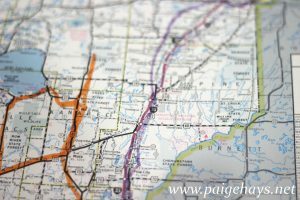 With modern cell phones and GPS systems, my state map collection had fallen to the bottom of the glove box. I pulled them out to recycle them, but instead found several fun uses for my children that I wanted to share as a free holiday travel idea. 1. A great car tip idea: Just let you child explore the map. Open it, close it, “read” it. Most kids have never seen and touched a full map, so this is a great opportunity to just explore. 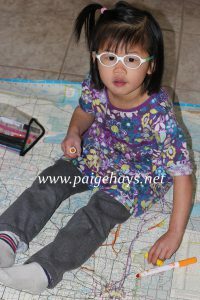 There are motor skills to open the folded map and hold it (great bilateral skills- using 2 hand together). Visual-scanning to look at the features on the map. Search for roads, river, lakes, and cities. Cognitive work to figure out what the icons on the map represent (roads, lakes, cities…). 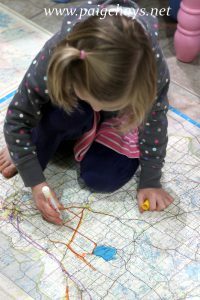 For older children, it is a good challenge of motor and planning skills to re-fold the map. 2. 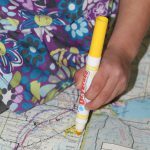 Tape the map to the floor (or the wall for a great vertical surface) and give your kids markers. I love giving children large spaces to work on the transition between gross (large) motor skills and fine (small) motor skills. This is fun way to practice coloring and tracing (think of all the long roads to trace!). This activity would also work great with small cars to drive on the map, you could add stop signs and bridges to create a fun pretend play game. A similar activity is to put a large map on the wall to draw on. 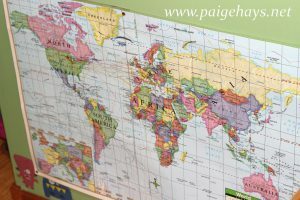 If you have access to a laminator, a large wall map with dry-erase markers makes a great place to work on cognitive and motor skills together (such as draw an airplane route from your state to Russia, circle all the countries that start with the letter B…). 3. Last, when all the fun is done, it is time to let your kids tear up the old map and toss it in the recycling. This task is always enjoyed by children of all ages- it is always a treat to be allow to destroy something! Crumpling up to throw away is a great hand-strengthening activity. Larger pieces require two hand together to work incorporating core, shoulder, arm, and hand strengthening. Add a new visual-motor element to the task by having the child toss the crumpled-up ball into a trash can a few feet away (experiment with different sizes of balls and how tightly it is crumpled-up).